Done looking? This is an unusual species of squid called a banded piglet squid. It looks a bit like an animal with a cartoon face, but that is not a face at all. Its tentacles look like hair while colour patterns form what looks like eyes and a mouth an a fin like flap forms what looks like a nose. Like many deep sea creatures it can produce light. The young quite a bit different to the adults. 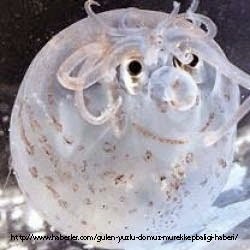 The piglet squid can be found in trapical waters all over the world and in the temperate North Atlantic. They lusually live between 100 and 200 m below the surface getting deeper as they get older.